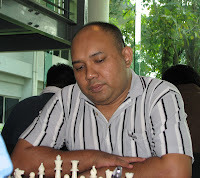 The 3rd AmBank Chess Challenge 2008 kicks off today at the Ballroom, 5th Floor CitiTel Mid Valley Hotel Kuala Lumpur. The tournament attracted 53 players. Other than the Malaysians are players from the Philippines (8),Bangladesh (3), Japan (1) and Indonesia (1). The foreign players are no push over. Of note are the Filipinos but the Bangladeshis are also highly rated in their FIDE rankings in this tournament. In the first round however it is interesting to see CAS Official Mat Zaki Yeop (left) securing a draw with the tournament top rated Filipino player Panopio Jr Rodolfo (Fide 2187).